Fig. (2) Zinc inhibits human CaV3.2 and CaV3.3 T-Type Ca2+ channels(A-B) Recording calcium channels CaV3.2 and Cav3.3 after application of 0.1 µM, 1 µM, 10µM and 100µm of Zinc (Zn2+), (C-D) Dose - response for Zn2+) injibition of CaV3.2 and CaV3.3, Fraction of unblocked peak current (1/1Ctrl) is plotted against Zn2+ concentration. 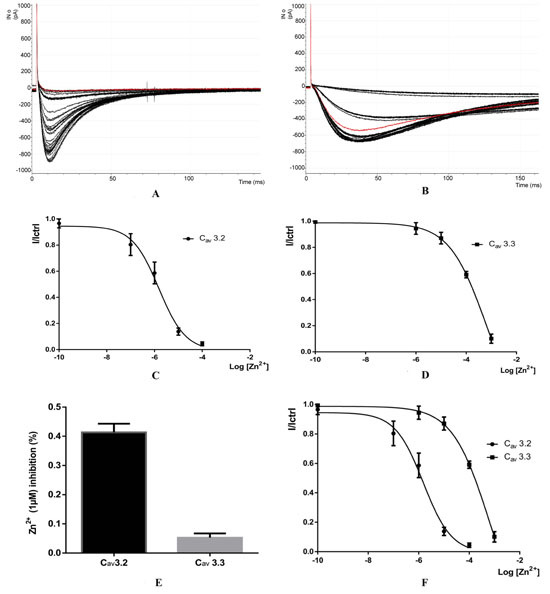 The IC50 values were obtained from fitted data using a sigmoidal does-response with variable Hill slope equation (e) Bar graph of the average inhibition of Cav3.3 currents by 1 µM Zn2+(F), dose-response relationships for Zn2+ inhibitaion of caV3.2 and CaV3.3 currents.